I’ve been a huge fan of simulation games since back in the day when a 1.5 GB computer was considered spectacular. I’ve built cities and empires, zoos and aquariums. I’ve created more virtual people than I can count and slaughtered enough of them that, if they were real, I would have ended up on the FBIs Most Wanted list. What can I say? I needed a graveyard for my haunted town! One thing I have never yet been, though, is a farmer. With Farming Simulator 15, now I can add that to my bucket list of virtual experiences. Note: I received a complimentary copy of Farming Simulator 15 along with a gift basket of farm-fresh goodies from Maximum Games in exchange for an honest review. All opinions are my own. See, I always wanted a farm. My brother’s great-uncle had one and I loved visiting it. The cows were my favorite (which is probably why I stopped eating them at 14). I thought it would be so much fun to be a farmer. Then I realized that it often requires getting out of bed before the sun rises and a little part of me died. Honestly, I would NEVER hack it as a farmer. They work SO hard every single day. I just don’t have the right skills. Plus, I kill every plant I touch. Except mint. Mint loves me. (Note: Screen shots are courtesy of Maximum Games, I do not know how to take pictures on the XBOX 360 and my son wasn’t home when I wrote this). For those of us who want to dabble in farming but know we’d never hack it as a real farmer, Farming Simulator 15 gives us a chance to see what life would be like on the greener side of the fence. The Maximum Games release lets you try your hand at creating a sustainable and beautiful farm. With so many dimensions to the game, it’s really fun for just about anyone. First, you have people like me who really just want to make a pretty farm and learn what it’s like to live that life without getting up before the sun. I had the most fun planting, cultivating, breeding animals and selling my goods in a farmer’s market. That itself is totally relaxing and entertaining. I don’t really know much about the tractors and equipment, so I kind of winged it with those. BUT, those tractors and all the equipment is a HUGE draw for my son and anyone who loves big machines. With over 100 different vehicles and tools, there are so many different cool things that chop, cut and drive. 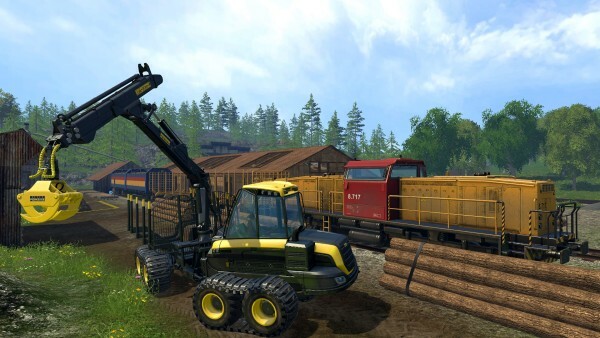 Speaking of chopping, Farming Simulator 15 has a whole new added dimension: a woodcutting industry. Farming Simulator 15 also has a brand new Nordic environment plus a renovated American farm, in addition to the other farms. Then you have the educational element, and wow, is this game educational. How? Let’s take a look at a few things you and your kids can learn! Time management skills with the growing and harvesting of crops. Money skills galore: how much it costs to buy something, how much you can get for selling it, profit margins, saving up for upgrades, etc. Business skills: farming is a complex business! Farming Simulator 15 also teaches kids to respect where their food comes from and the people dedicate their lives to getting it to us. Farmers are responsible for pretty much everything we eat. Think about it: everything has at least some ingredient that comes from a farm. While you can play the game right out of the package for hours upon hours and never get bored, if you want to add more dimensions to it, head to the Farming Simulator website and grab the DLC packs for $9.99 to add extra equipment. Still want more action? Check out the mods. The Farming Simulator mod community is very dedicated to the game and most of the mods (if not all) are free. You’ll find vehicle upgrades, new decorations and more. If you get stuck on something or need help, they also have a great forum community. 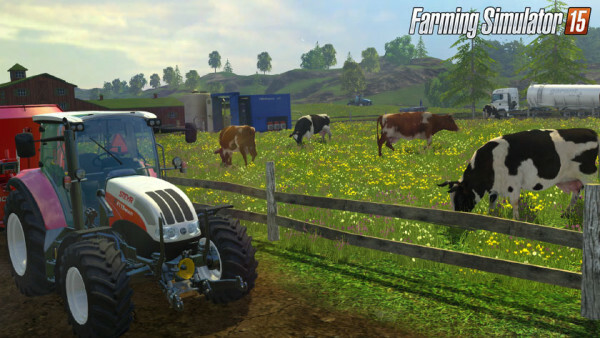 To learn more about Farming Simulator 15 and check out other fun games, check out Maximum Games! 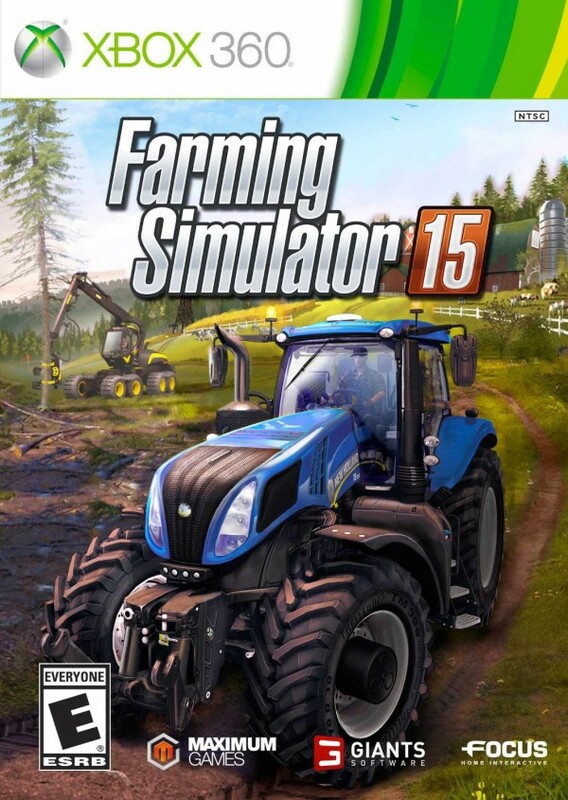 Order your copy of Farming Simulator 15 on Amazon. Prices vary from $29.99 to $49.94 depending on console. Enter below for a chance to win Farming Simulator 15 on your choice of platform (XBOX One, XBOX 360, Playstation 3 or 4, or PC). Giveaway is open to US residents age 18+ and ends on June 22. Good luck! I live in a farming community,the main employers here revolve around farming so my kids love and are fascinated by big tractors,planting,the crops themselves, the selling portion would be new to them and quite interesting. The farming simulator sounds like so much fun! I love the whole idea of the farming simulator, but the growing part would be the best – thank you! I like the tractors for sure! And all the add ons and other equipment you can get too! I know my son would love to cut down trees and mow grass!